Anthrax Protection - N95 Particulate Respirator and Surgical Mask - Regular size - Case of 120 masks (6 boxes of 20 masks). 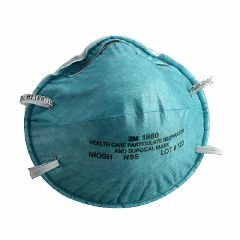 A particulate respirator and surgical mask that is NIOSH approved as a Type 95 respirator. N95 Respirators are, at a minimum, 95% efficient in filtering against particles 0.3 MICRONS and larger. NIOSH approved as a Type N95 respirator to meet OSHA requirements and CDC guidelines for TB exposure control. Can be used during laser surgery, electrocautery and other procedures using powered medical instruments to help reduce wearer exposure to airborne particles generated during these procedures. Fluid resistant to help reduce potential exposure of the wearer to the spray, spatter and aerosol of blood and body fluids. Does not contain either natural rubber latex or dry natural rubber as components in the product or its packaging. Available in regular and small sizes to fit a variety of face shapes and sizes. Respirator includes a soft inner shell for greater comfort against the face. Hypoallergenic to reduce chance of allergic reaction. Warning: This respirator helps protect against certain particulate contaminants but does not eliminate exposure to or risk of contracting any disease or infection. Misuse may result in sickness or death. For proper use, see your supervisor or call 3M OH&ESD Technical Service at 1-800-243-4630. The National Institute for Occupational Safety and Health, or NIOSH, is the government agency responsible for testing and certifying respirators. Currently NIOSH is providing the public with the following information. We believe that additional definition and changes are likely to occur as NIOSH and other government agencies formalize their recommendations. NIOSH does not currently test and certify respirators for use against chemical or biological warfare agents. The respirators are currently tested and certified for hazardous industrial contaminants and applications. In discussions with NIOSH, they suggest using either an air purifying half facepiece respirator (that is one that fits over the nose and under the chin) or an air purifying full facepiece respirator (one that fits over the eyes and under the chin) with P100 (high efficiency) filters for dusts and other solid airborne contaminants and a cartridge for organic vapors and acid gases. These respirators can only be used for escaping from an area and not longer-term exposures. They are also not effective with high concentrations of these agents. Since these respirators do not supply oxygen, they cannot be used in oxygen deficient areas. Respirators reduce, but do not eliminate exposure to chemical or biological agents. Respirators do not eliminate the risk of contracting illness, disease or infection. Some chemical warfare agents are not effectively filtered by industrial charcoal cartridges. There may be no obvious warning in the event of release of biological or chemical agents. Respirators may help protect your lungs; however, some chemical agents may be absorbed through the skin or eyes and other protective equipment may be required. Without proper decontamination, materials could create a hazard by bringing the agent into the home. NIOSH does not currently certify respirators for use against chemical or biological warfare agents. It is also important to understand that respirators are designed for occupational/professional use by adults who are properly trained in their uses and limitations. Fit of the respirator to the face is very important. If it does not fit properly, you will be exposed to the agent you are trying to filter. The individual must be clean-shaven to wear these products. Some people may find a respirator difficult to breathe through and you may want to consult a physician prior to use. The products are not made to fit children's faces. All of these are issues that you need to be aware of before making a personal decision regarding use of respirators. These N95 masks are great for Ebola, MERS, Flu and other airborne virus protection. These masks block alpha particles and low-energy beta particles from entering your system. Ebola hemorrhagic fever is a severe and often deadly illness that can occur in the human body. Health organizations recommend to avoid areas in which there are epidemics. For full protection its ideal to wear a gown, gloves, and mask around sick patients. These precautions will greatly decrease the risk of transmission. Exceptional Protection. Great fit. No Ear Loops. Use in hospitals. Yard work. Anywhere there's dust. Anywhere there's dust. Lung cancer survivor. COPD. 59 y/o.